I adore Maggie’s teachers. They are a team of professionals with high expectations of not only themselves, but also the students and families in their classrooms. They have strong opinions about public education and literacy, some of them unconventional but all of them in alignment with my beliefs. Thanks to them, many inquisitive little minds absolutely love coming to school each and every day. Oh, and they have a great sense of humor. I think that’s sort of mandatory when working with 1st graders. Back in September they hosted a parent night, where they discussed their educational philosophies and basic classroom procedures. They also talked a bit about their discipline policy. Basically, they have created a Whoops! slip system. Children who make bad choices are asked to fill out a Whoops! slip, where they take ownership for their mistake and make a plan for how they will act differently in the future. After three Whoops! slips, the child has to call home. Apparently this phone call is often wrought with tears and dramatic 1st grade emotions, so the system is fairly effective. After the parent night, we asked Maggie if she knew about the slips. She promptly launched into a saga about the poor boy who was the first recipient of a classroom Whoops! slip. He had taken a bin of links that were intended to be used for math activities, and turned them into a giant jump rope. When he was caught twirling and leaping with the monstrous contraption, the consequence was rendered. Whoops! slip number one. The thought of getting a Whoops! slip was horrifying to Maggie. She proudly declared that she would never, ever get even one, let alone three. It was unthinkable. This morning I got an email from one of Maggie’s teachers, stating that she had given them quite a scare. Apparently she left the room without permission, resulting in a frantic school-wide search. 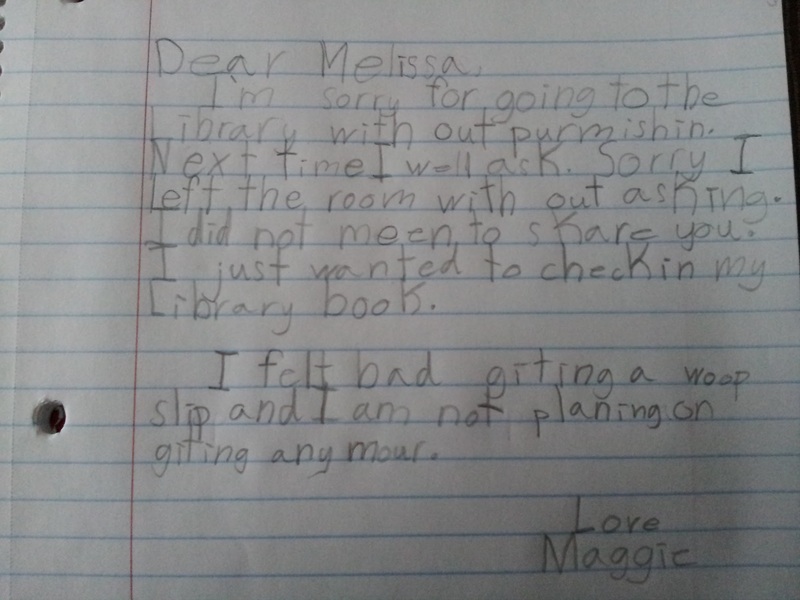 Thankfully, she was safely located in the library. Phew. But the worst part, the teacher said, was Maggie had convinced another child that it was okay to come along too. Double whoops! Now she was both a rule breaker and an instigator! This might be a good time to mention that one of my good friends has a daughter in Maggie’s class. Our girls run around at recess pretending to be half cheetah, half horse. They play house. They climb monkey bars. It’s been fun watching them become innocent friends, especially since they are both such good kids. You know, the kind of kids who don’t get Whoops slips! I should have guessed that her daughter was the one who Maggie had invited along for the illegal joy ride to the library. Little did I know that, thanks to Maggie, our girls both received their first Whoops! slip today. Whoops. In the grand scheme of things, this is a whoops I can handle. Case closed.